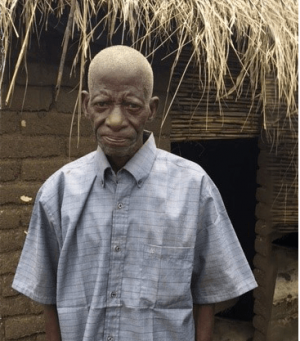 Enoch Gambaluga is believed to be 85 years old. He lives with his wife in their mud brick hut in the village of Zinganyama, Phalombe District, southern Malawi. The area where Enoch lives has black volcanic clay soil—which is great for growing his maize staple, but every year during the wet season, his pit latrine would collapse. As he became older, it became harder to dig new pits every year. United Purpose (formerly Concern Universal), funded by Australia’s CS WASH Fund, is working to improve the delivery of sustainable WASH services in poor communities in Phalombe District of Malawi. The UP team suggested to Enoch that he may like to try an innovative ‘ecosan’ toilet. This system does not require a deep pit like conventional pit latrines, and so is more sustainable in areas prone to flooding. Instead, two shallow pits are positioned side-by-side. Every nine months, Enoch just has to cap off one pit, and begin using the other. After nine months, the faecal matter has completely decomposed and dried out. It is non-pathogenic, and ready to spread onto the garden as organic fertiliser. Enoch says that at first the idea seemed strange, but now he thinks his toilet is fantastic. For the first time in years, his toilet has survived the wet season; and his maize crop is looking great.